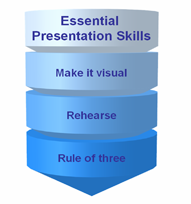 This free PowerPoint template gives a simple but highly effective technique in a presentation, using a graphic of a rubber stamp. This could be used for simply adding the word “Draft”. 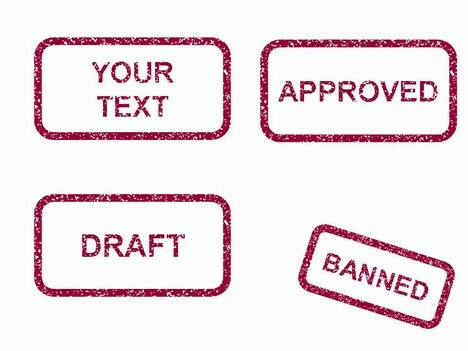 It could also be used to show concepts that are official, such as the words censored, banned, official, approved, passed or genuine. It could also be used for fun things such as “first place”, or ‘Welcome to Barbados’. These stamps are easy to make and change as long as they are on a plain white background. 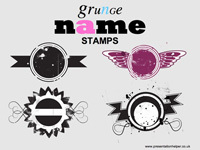 The stamps consist of a transparent overlay that is actually a mottled image (a transparent gif). Simply move the text under the overlay to produce the mottled effect. We even used this stamp effect to produce the “Banned” graphic on our sister publication Call Centre Helper. 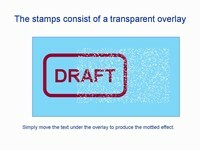 Could be used to make stamps with the words censored, draft, watermark. Thanks!…but how to change the transparant overlay color? This example works fine with a white background. Many thanks. Very useful and innovative. Thanks so much. Simple and useful. Great ppt. Exactly what I was looking for. Thanx! I used it to make a TAKEN stamp image for t-shirts for my husband and I for our gift opening the day after our wedding. Thank you so much for this beautiful tool! I found this to be a useful way to rubber-stamp overarching ideas on top of plots in an engineering presentation to a mixed audience, some of whom will not make the desired conclusions from the plots alone. I added the ‘stamps’ sequentially with animation (fade in, very fast, upon click) to allow the audience to see the plots before they become obscured with ‘stamps’. 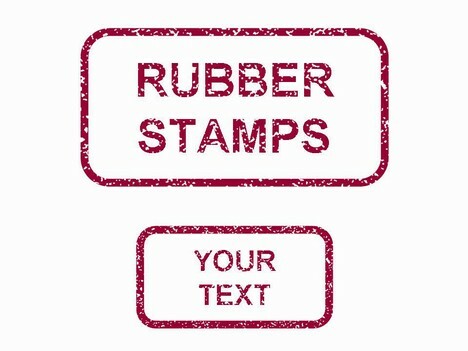 I modified the color and style of the text box layer to make the stamp green (meaning desired outcomes) and to given it a more old-fashioned double-lined rectangular border. 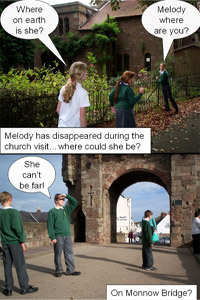 I could group the speckled layer with a text box, but even grouped, they wouldn’t stay grouped to resize. I had to ungroup, move the speckled layer a little off the text box, resize the text box, then re-stack and resize the specked layer and regroup them every time. They would stay together while grouped for movement. If anybody has an idea to make the grouped stamp resizable, it would be appreciated. really cool, super useful, thank you! It’s great. Thank you very much. I am unable to edit the stamps. I downloaded the file as a PowerPoint file. Is there something I am doing wrong? thank you very much. very easy to use. clean design. Awesome. Really cool and free.Helped to get my PhD presentation in a fine shape!! !